Some things feel impossible. Like learning how to tie your shoes. Doing long division. Making salt-free bloody Marys. But luckily, there’s this little tiny fiery cheerleader inside all of us, just waiting for those can’t do moments, that lights up and pushes forward to make those bow knots. To use a calculator. Or, of course, make a version of the classic salty brunch drink from scratch, at home, without all that sodium. Tiny fiery cheerleaders just love a good obstacles. It’s when they do their best work. And last week, I swam through almost 700 (SEVEN HUNDRED) of your best salty challenges. Salty dishes that you wanted to make over. From chicken and dumplings to corned beef and cabbage. And what I loved most about this long list was how you didn’t hold back. You let your imagination run wild. You dared to ask for the impossible. Because I think you know now that even the most dauntingly difficult salty challenges are never as hard as they seem. And that my tiny fiery doesn’t mind working overtime. But want to know the best news? A lot of those low-sodium makeover wishes you sent me have already come true — on this blog(kalua pork, enchiladas, corn dogs, hot dogs, pickles, pizza, pretzels) and in my new book (French onion soup, pad thai, teriyaki chicken, clam chowder, corn chowder, pumpkin pasta sauce, fish sticks, mac n’ cheese, and buffalo wings, to name a few). So if you’re looking for something, simply type some keywords into the “SEARCH” field to the right and see what salt-free makeover pops up. Or, if you can’t find what you’re looking for, just let me know. Like a bloody Mary, perhaps? Your wish is my command. 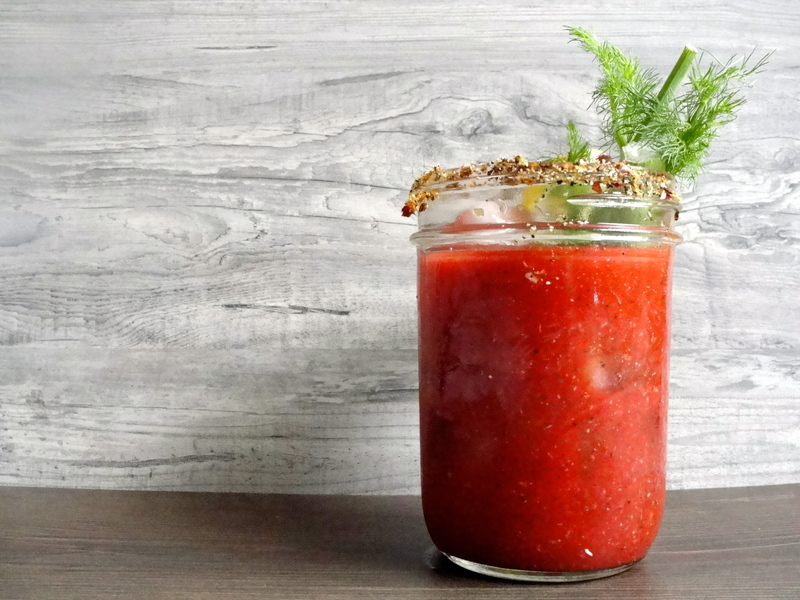 To cap off this week and start of this weekend, I want to gift you the seemingly impossible salt-free beet Bloody Mary recipe from my new book. It’s bright, it’s tangy, it’s peppery, it’s hot. It’s perfect. It’s served in a mason jar. Doesn’t it just make your mouth water? It’s not impossible, it’s impressive. It’s a winner. And speaking of winners, I’m happy to announce that Ana C. won the coveted Vitamix from last week’s Love Your Heart Recipe Rally. I see many blended Bloody Marys in her future. For everyone else that participated — THANK YOU. And get ready, because, guess what. I’m giving ANOTHER VITAMIX AWAY as well as a signed COPY OF MY COOKBOOK. I know. You just fell over. Sorry about that. All you have to do is enter the Rafflecopter giveaway below for your very own blender of inspiration (aka Vitamix). The giveaway begins today, Friday, February 22nd. So as soon as you are done reading this sentence, simply follow the instructions on the Rafflecopter Widget below and leave a comment on this blog post with your favorite low-sodium substitute for super salty ingredients. The giveaway will close on Friday, March 1st, 2013 at 11:59 PM PST. The winner be notified by email and announced on this blog and the Rafflecopter widget on Monday, March 3rd, 2013. All rules and regulations can be found at the end of this post and in the Rafflecopter Widget. So come join me for some low-sodium fun. Enter the SECOND VITAMIX givewaway. And get those little fiery cheerleaders revved up and ready. If you are using a juicer, juice the celery, beets, and bell pepper. Place liquid into a pitcher or large mixing bowl and add the tomato puree. If you are using a blender, put the celery, beets, bell pepper, and tomato puree into a blender. Pulse until you have a vegetable smoothie. Then make a sturdy pouch out of some folded cheesecloth and, over a pitcher or a large bowl, carefully pour the blended veggies into it. Gather the cheesecloth at the top to close and then squeeze. Really squeeze, many times, until all the juice runs out of the cheesecloth and all you have left inside is dry veggie pulp. If you don’t have cheesecloth, you can also pour the veggie smoothie into a fine-mesh sieve and use a wooden spoon or the bottom of a ladle to press down on the puree, squeezing the juice through until you have strained every bit into the pitcher or bowl. Set all your vegetable scraps aside. Now that you have your vegetable juice, add 1 teaspoon of the horseradish, 1 teaspoon of black pepper, the smoked paprika, cayenne pepper, juice from 1 lemon, and vinegar to the pitcher or bowl. Whisk together and taste, adjusting spices (oh hello, horseradish and pepper) according to your cocktail preferences. I like mine spicy! Place your pitcher or bowl in the refrigerator to chill, 15 minutes minimum or 2 hours maximum. When you’re ready to serve, fill glasses with ice. Pour in Bloody Mary mixture and add a celery stalk for garnish. Cut the remaining lemon into wedges and offer them to guests as well for extra citrus punch. Finally, stir, sip, and savor. NO PURCHASE NECESSARY. Winner must be a US resident in order to win. Winner will have 48 hours to respond to email to claim prize before another winner is chosen. The name of the winner will be announced on SodiumGirl.com and the Rafflecopter Widget once the giveaway has closed. In the event the Sponsor (Vitamix) fails to send the prize, the Host (SodiumGirl.com) will not to be held responsible or liable in any way. This promotion is in no way sponsored, endorsed or administered by, or associated with Twitter or Facebook. Complete terms and conditions can be found within Rafflecopter Giveaway Widge above and here. My favorite low sodium substitute is lemon juice. It packs a punch and adds a bunch of flavor. I also love my no-salt chipotle chili powder. Oh man. So excited for another shot at this most coveted blender. My favorite sub for salt is nutritional yeast. I recently discovered this vegan secret when I had to give up gluten, dairy, and soy. It’s very flavorful and I put it on lots of things-popcorn, baked potatoes, shrimp & grits. Love it! well, it’s not creative, but it’s really good: Herb-Ox Salt-Free Boullion Packets (Chicken or Beef)! My favorite, most creative super salty substitute is mincing raw garlic with a little cayenne pepper powder and sometimes add a splash of lemon juice, depending what I am eating. 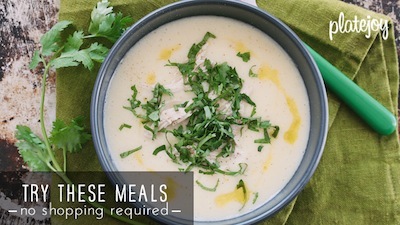 It adds a punch and tastes great with lots of different dishes. Sounds yummy – I can’t wait to try this! Thank you for all your wonderful recipes, as a sodium restricted heart patient I really appreciate the tasty recipes. Homemade cream of mushroon soup instead of one from a can. I like to use Citrus juices or a variety of spices, such as smoked paprika , garlic powder, and black pepper. I love spicy things! Cayenne, paprika, red pepper flakes, combined with other savory spices punch up the flavor with no need for salt. I sprinkle lemon juice on lots of vegetables instead of using salt. A generous squeeze of fresh lime and a shower of chopped cilantro makes almost any dish more delicious, and I never miss the salt! I am new to the low sodium life style so I don’t have a favorite substitute. I do like lemon though. I am gonna love this thing. It has been on my wish list forever. Can’t wait to have my date with it. To replace all the sodium in taco meat, step up the spices like cumin and paprika! You won’t miss the salt. 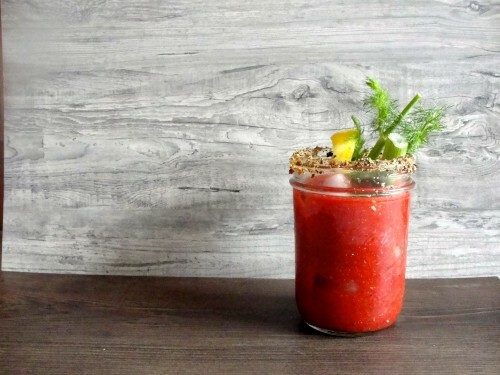 Thank you for the Bloody Mary recipe! If you use a blender (all the while wishing for the Vitamix) I bet a food mill might also help to express the juice from the veggie smoothie. Can’t wait to try the recipe. I have found that you can jazz things up with anything super flavorful and you won’t even notice the lack of salt, e.g. anything with spice (cayenne, pepper flakes), lemon or lime, garlic, etc. I never add salt to anything (never have) and I never miss it. I love using garlic powder in foods to provide flavor without extra calories. I also love using fresh ingredients such as green onions, dill or basil. 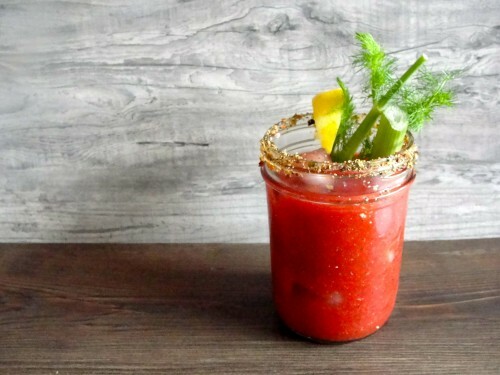 I’ve never had a bloody Mary… I might have to make this one! Salt free vegan bouillon cubes to make broth – you get the broth flavor without the salt and you don’t even miss it! Is there a reason there is no Vodka in this recipe? I am new to trying to eat a lower sodium diet so I am wondering why you can’t just use no or low salt tomato juice, low sodium Worcestershire sauce, pepper and a celery stick? Then season to taste with other non salt spices to taste….. And of course the vodka. First, the vodka! I wanted to keep it alcohol free for those that do not drink the hard stuff. As for the low-salt tomato juice and Worcestershire, well, even the “low-salt” versions or not very low in sodium. Which is why this version makes use of the natural flavors (and even sodium) found in whole veggies! And beyond being healthier, it tastes way better than the package stuff. I like to use fresh herbs; I grow them all year. How did I not know about your site? I must be living under a rock …. anyhow, I just stumbled upon you via my friend Cheryl’s site and am thrilled to have found you! I am not a big salt user – tend to only season once cooked, but am always looking for new inspiration that will benefit our diets. My partner, Lenny, has high cholesterol and cutting back a little bit on everything is key for us. I cannot wait to dive into your site even more. Thanks Denise! I am a HUGE fan of Chezus! And so happy to see you on the blog. Let me know if you and Lenny have any dishes you’d like me to salt-free! And I forgot to say my favorite substitute! I like my lemon pepper grinder from Trader Joe’s! Goes great with so many things! I eat mostly Mexican food, so fresh lime and chopped cilantro is all the seasoning I need! I like to make a wet herb rub, sort of like a chimichurri. I put cilantro, parsley, garlic, and shallots in a blender. I slowly drizzle in oil. I finish with a splash of fresh lemon juice and a touch of vinegar (usually white wine vinegar). I use this as a drizzle on grilled meats, veggies and more. I also add spices like curry or cumin to it and make a marinade out of it. I am new to low sodium diet so don’t have a favorite substitute yet. I use pepper, lemon juice and WASABI. That stuff works wonders! I love lemon juice…punched up with lemon zest and pepper, it’s even better! For me, I use spices like garlic, salt, cumin. I don’t miss the salt at all. We try to limit is as much as we can. Thanks for the chance to win a Vitamix. It’s been on my wish list for a long tim! I use no salt bullion cubes. Tastes great! Bay leaves, onion powder, garlic and curry powder. Hi Donna! Miso paste is quite high in sodium (usually over 700mg sodium per tablespoon). In its place, you might want to try molasses, pomegranate molasses, or even tamarind paste! Thank You for your presentation at the Northwest Kidney Center yesterday was very inspiring! 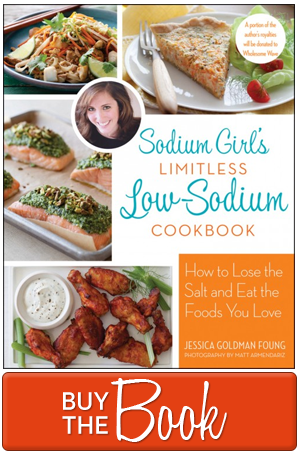 I am also new to low sodium diet and haven’t tried any substitute. Lots of great ideas!! Not particularly original but I used spices, I like celery seed. Thanks for the recipe and a chance to win. I love all these great ideas to substitute sodium. Never would have thought of half of them. Lemon Juice or spices like garlic and onion. Wow, I just came across your site by accident when looking for low sodium recipes. I have also been wanting a Vitamix for so long! We don’t really use salt in our foods and try to limit them. Don’t use anything special, just expirement with a bunch of different spices. After hearing you speak the other day, I was inspired to go home and make my favorite Indian recipe- saag panner- from scratch without salt rather than ordering it from my local Indian restaurant like I had planned. So in that case I used turmeric, cayenne, coriander, cumin, ginger and garlic and onion to give LOTS of flavor. So delicious and I always feel SO much better when I cook low sodium. I’m excited to start following your blog. I hope you come to Seattle again soon- I know of so many other people that would love to hear you speak – you are so inspirational. Thank you! No need for the blender. Just wanted to say I am inspired by all the work you do! Looks great. But the tomato puree has way too much potassium to use in one drink. Would have dilute and cut it with something to break down the concentrated puree. Good to know I can still have a little stiffness in the morning. As an ex salt junkie all these recipes have given me hope that there is life after salt. Although its been a struggle, I can safely say that the carvings are beginning to subside. This website has really helped. Thank you. Don’t miss salt anymore & try to avoid where I can….so good to see Vodka in this Bloody Mary doesn’t affect those stats! I think I would prefer 1 Lime & 1 Lemon…..but have never had horseradish in a BM before…..looks like I now have something to test this weekend!! I rarely (aka “never”) salt my food and rarely use salt when cooking unless it is totally necessary for the other ingredients activation. My favorite substitute for salt is long hot peppers. I can add as little fiery flavor as I like (or as my guests like) or, since I like really spicy food I can add more to my own dish after cooking. (especially if I have dried the pepper and crumbled it into flakes). Delicious!